I don't know any Gastons either, unless you count Gaston Lagaffe... He's a well-known comic book character, created by Frenchman André Franquin. In English he's known as Gomer Goof. (An inspiration for Gomer Pyle? 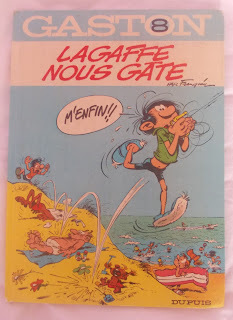 He does look a bit like him...) The title here, Lagaffe nous gate translates to "Lagaffe spoils us." His comment, M'enfin !! means, "What the --?" Comic books like this series are a big hit here, for both young and old kids. They're called BDs, an abbreviation of bande dessinées in French. Gaston came about in 1957. This Peter Pan-like boy is known to be lazy, irresponsible and oblivious to the world. Common sense is completely absent. A regular theme of the strip is his effort to avoid doing any real work. His age is never clearly defined; he is expected to be in his late teens, yet he has worked in such fields as rocket science, chemistry and telecommunications. He is both endearing and completely exasperating to his stressed-out co-workers. By the way, the real St. Gaston was a bishop from the turn of the sixth century and was also known as St. Vaast. He was known for converting Clovis and for teaching him after the victory of Tolbiac in 496.